A recent tweet from Mark Rosewater, Head Designer for Magic: The Gathering, confirmed the news that the next big Magic product is geared towards the Modern format. This information comes as a response to a tweet by Tolarian Community College, asking for more information regarding a previous statement made to him by Wizards of the Coasts employees. In this statement, the Professor is told that Modern players should look forward to the end of February. Now, thanks to Rosewater’s tweet, we know why: There is a new Modern product on the horizon. But what could it be? The return of Modern event decks? A while back, Wizards of the Coast released an event deck for the Modern format called “March of the Multitudes.” The idea of this product was to make a competitive yet affordable deck that any new player could pick up for a night of Magic with friends or at a Friday night Magic event. While by no means top tier, the deck was decent for its price. Event decks existed for multiple Standard environments, (There was one for every set between 2011 and 2015.) but March of the Multitudes had been the only one specifically meant for the Modern format. With this in mind, it’s possible that this new Modern product may be one or more new Modern event decks. In addition to promoting the format, these decks could also serve as a reason to reprint cards that are desperately in need of it in Modern right now, such as Noble Hierarch ($40), Liliana of the Veil ($70), Blackcleave Cliffs ($37), Chalice of the Void ($36), Tarmogoyf ($46), and Fetchlands ($13-$80). A complementary set geared towards Modern? In the past, Wizards of the Coast released sets such as Conspiracy, Conspiracy II, and Battlebond that were all supplemental sets. New cards from these sets didn’t enter any Standard environment, and they didn’t enter the Modern format. However, because Legacy and Vintage allow the use of all printed Magic cards outside of Un-sets and banned/restricted cards, WotC was able to print new things and reprints for Vintage and Legacy in these supplemental sets. It’s possible that this new Modern product is of a similar design, except with a focus on Modern. Maybe we’ll see new cards printed specifically for Modern? Or maybe, like with the event decks idea, we’ll see much-needed reprints. The prospect of new cards is an interesting one. 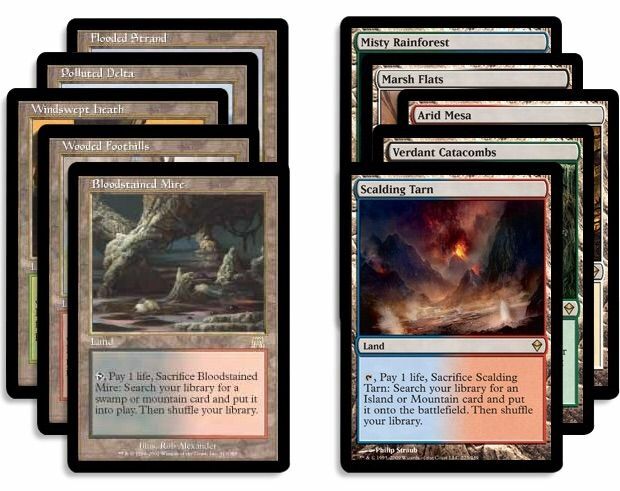 Modern right now is a very fast and brutal format, with most decks capable of dealing lethal damage on turn three. Right now, if Wizards of the Coast wanted to print cards to stymie these aggressive combo and aggro decks, they would have to put them through Standard because every Modern card must go through Standard first. However, due to the power level difference between the two formats, those cards might be far too good in Standard. If there were a way to print cards straight into Modern, then WotC would be able to better control the format without accidentally hurting Standard. Maybe this is what this new Modern product could be for? At the end of the day, we have no idea what could be up Wizards of the Coast’s sleeves. Maybe its another arguably overpriced set, or maybe it’s another overpriced and exclusive set. Maybe it’s something more reasonable and affordable for the average MTG player or for new players looking to get into Modern. It could be Modern integration with Magic: The Gathering Arena, although that seems like it should be a long ways off. Whatever it may be, Mark Rosewater has declared that he will be floored if us Modern players aren’t excited with the upcoming announcement. I, for one, wait eagerly for the unveiling of this mystery product.